Meditation & the Science Behind Why it Works. Usually at the end of teaching a class, while students are resting in savasana, I’m meditating, submerged in that sweet, soft space we have cultivated together. The air is thick, the energy having palpably shifted; the space between each other has thinned, the illusion of separation has dissolved some, and each breath becomes an affirmation of inherent interconnection. It’s one of the reasons why I am drawn to teach: that feeling of oneness that my Knowing Self tells me is my most natural state. But one class some time ago, I could not meditate. There are moments in this practice that affirm why we practice; this class was one of them, and I remember it just as one does any pivotal life lesson—with clarity, affection and awe for how any single moment can prove so rich, like the moment you realize you’ve finally learned to communicate in another language. That night, thoughts of a painful life event—the severing of a relationship—had my mind on the run. Despite an hour-and-a-half of sweaty teaching, neither my body nor my mind could find stillness. As bodies in the room melted on the mat, I ruminated. I harassed myself with cruel, circular thoughts. Oh the judgment! If I were only more attractive…If only I’d kept my feelings to myself…Oh the fear! Would I love again? And the greatest fear: am I fundamentally unlovable? These thoughts’ sharp talons pierced my mind. Injured feelings spawned angrier, more ravenous thoughts, gorged on a sense of my own unworthiness. These thought-feelings dug their teeth into the meat of my heart, and took big, glutinous bites. So viscerally, still, I remember the sensation of those thought-feelings: wild and ravenous, devouring all potential for another thought, let alone a more positive sense of self, to exist. Those kinds of thoughts are a mutated virus; they grow rapidly, exponentially, infecting healthy cells until it feels as though no healthy tissue, no space for healing, survives. We fight them, they adapt; they are victorious, so often, because they know all our weaknesses. Compounding my sense of shame and inadequacy, I remember the feeling of self-judgment for having these thoughts—how could I purport to teach a practice of self-acceptance if I still was wracked by the mental malaise for which I claimed yoga was an antidote? That thought pattern—“you should know better”—was another brilliant way by which my mind was waging war. The thing about battling yourself, is that you’re a very worthy opponent. It’s important to note that the substance of my teaching rests in what I perceive as the primary gift of this great somatic meditation we call yoga: yoga asana can be, if we choose to practice it as such, a practice of profound, joy-engendering self-acceptance. It comes about through the practice of continual, vigilant returning to what is. As we notice the feeling of being here, now, anxiety derived from that which isn’t present can melt away—though that it will is not inevitable. It takes vigilant practice, and it’s uncomfortable at best. But, as millennia of yogis can testify, it’s possible. And that’s why we practice. Because, indeed, it’s rare that the source of our anxiety is actually presently manifest; more often than not, what spurs that frenetic, cannibalistic thought is a judgment—either of past, or future. When we can focus on the physical feeling of the “here, now,” it gives the mind an anchor into the present moment in which the source of the anxiety does not actually exist. The physical practice of yoga is one powerful way to practice that very process. Yoga asana can become self-guided, somatically mediated cognitive behavioral therapy. When the mind is crowded with its own self-inflicted carnage, the body—like an adjacent clean, bright room—offers the space to practice perceiving oneself and one’s circumstance in a different way. The body offers the mind the space to make a choice; yoga asana is a conduit for practicing choosing joyfulness over suffering. On my mat that night, at first, the capacity to practice this present-centered awareness eluded me. And then…I remember the moment: It’s like I intuitively flipped a switch. My commitment to the practice of yoga availed me to an internal switch that before yoga I hadn’t known existed. A loving voice cut through the noise: “Julia, be here, now.” And I said to myself, again, “Be here, now.” I repeated, “Be here now.” I took a deep breath in, and breathing out I repeated, “Be here now.” And again, and again, and again, inhalation after exhalation…those words became my mantra, my breath-linking meditation. I began to notice the feeling of the mat beneath me. I noticed the feeling of breath pouring from me, and into me, and from me. Like an antidote to the virus. The feeling of being here, now, like a salve to self-inflicted wounds. Meditation had gotten me out of that cruel, fear-driven story I was telling myself on repeat, and returned me to the blessed present moment, in which I was doing the work I love in that sweet, soft, safe, loving, open space of the yoga room. In that moment, I was no longer unattractive, or unloveable. In that moment, I was in that moment. Nothing more, and certainly nothing less. Having experienced that night what felt to me a veritable structural cognitive shift at the hands of this practice, I have sought to understand the physiological mechanisms behind the change. It’s one of the reasons I undertook an MA in Clinical Psychology, and am currently pursuing an MS in Yoga Therapy: fundamentally, as yogis have always been, I am a scientist, interested as much in the mechanism of the process as its benefits. What’s awesome is that modern science now affirms what scientist yogis have known for millennia. Tools like functional Magnetic Resonance Imaging, or fMRI, are revealing the very physiological changes underpinning the experienced benefits of yoga and meditation. For example, research conducted by Dr. Britta Hölzel (2008) on a kind of meditation that purposefully induces body awareness reveals activation of the right anterior insula, as well as an increase in its volume when meditation is practiced over time. This indicates a) a particular part if the brain (the insula) related to awareness of self and b) validates that the brain’s very physical structure can change over time with regular meditation. Researcher Dr. Norm Farb has also done work around this very concept. Farb (2007) examined the brains of novice meditators engaging in exactly the kind of present-centered body aware meditation I intuitively shifted into that night, and found strong activation in the medial prefrontal cortex (mPFC), a part of the brain that plays a large role in interpreting the meaning of states of the body. Farb suggests that through the activation of both the insula and the mPFC, even novice meditators are able to experience an event as it is, and thereby consciously appraise its meaning. The implications are that meditation activates the brain in a way that can move the practitioner out of a judgmental, habitual habit thought-feeling pattern (such that I was in) and toward the capacity to choose how to perceive and assess the present moment circumstance (such as the one I found). Additionally, Farb also found that even novice meditators experienced a decrease in activity in the amygdala, a part of the brain particularly related to emotional responses. Therefore, beginning a meditative practice availed novice meditators of the capacity to a) shift out of habitual story and b) downgrade the emotional response associated with that story. To further explicate the implications of Farb’s research: even novice meditators are more able to attend to the feeling of the present moment, as opposed to getting pulled into a story about a past thing and caught up in ensuing emotion. For example, let’s say you’ve experienced some physical trauma. Someone in the present moment puts their hand on you, maybe even a loved one. They mean no malice with their touch—they might even mean to sooth—but for you, every touch is a reminder of the trauma. Every time you are touched, you are pulled back into the story of that trauma, and all of its collateral thought-feeling processes which have proven, time and again, to engender suffering. Farb’s insights reveal that that meditation practice strengthens the muscles around attending, meaning the mind becomes better and better equipped to receive an experience, such as that friend’s touch, and see it for just that—the non-threatening present-moment touch of a friend. Even more exciting is Farb’s research into the brain function of experienced meditators, those he defined as having practiced between 1,000-4,500 hours. Farb’s scans revealed that while the insula was highly active, the mPFC was not. That is, in long-term meditators, the need to re-assess was less present because the capacity for body awareness in the present moment was so strong. Experienced meditators needn’t circuit through the multi-step process of noticing, appraising, re-appraising, and emotionally down-regulating: the sheer act of noticing is enough to experience the moment, as it is. For experienced meditators, the present moment is not clouded by the storms of past experience. For the practiced mind, as Gertrude Stein (1922) wrote, “a rose is a rose is a rose.” A rose is not a failed relationship. A rose is not a funeral dressing. A rose in this present moment is not that rose that pricked you years ago. A rose is, simply, a rose, and what Farb and other researcher’s data suggests, is that regular meditation avails the practitioner more fully to an experience of the rose, as it is. Research like Farb’s is linked to a developing body of research on how meditation changes the brain, such as that gathered by Dr. E. H. Kozasa (2012), which suggests that long-term meditators are able to attend to a task with less prefrontal cortex activation. That is, regular meditators can pay more attention with less effort. Additionally, and perhaps most interestingly, Farb found that though the mPFC was less active in experienced meditators, the emotion-circuiting amygdala was more active. The hypothesis, then, is that experienced meditators can more fully be with their experience, whatever the thought-feeling stirred. Experienced mediators may need to do less exhausting emotional management, less numbing, avoidance and dissociation, less tip-toeing around threatening thoughts and their related emotional states. Theoretically, experienced meditators are more able to stay with a challenging moment, perhaps because they have had, also, an experience of it passing. The larger point I glean, then, is that if one is less likely to dissociate, and thereby able to attend to the discomfort, then one will be less likely to dissociate in general, and therefore more likely to fully experience life’s joyful moments when they present. The theory I propose, then, is that regular meditators are able to experience life without reacting in ways that necessarily engender more suffering; additionally, meditators may be more able to enjoy the full spectrum of life’s emotional presentation, and that includes profound joyfulness. Additionally, as mentioned above, there is increasing data to suggest that not only does meditation strengthen the muscles of present moment attending, but that it also helps aligns one’s self-concept with reality. This is essential in that one’s appreciation of the present moment is only as healthy as the lens through which it is viewed. Though the research around this construct is still largely hypothetical, it rests in the way yoga is believed to affect the aforementioned part of the brain, the insula. This particular chunk of neuronal tissue is responsible for the way we view ourselves; a dysfunction in the insula is believed to be related to the kind of dissociation evidenced in body dysmorphia and often co-morbid eating disorders. Notably, as theorized by Hölzel et al. (2011), the shift in insula activity inspired by mindfulness meditation can bring about changes in self-perspective by positively impacting body awareness. As someone who used to enjoy a profoundly unhealthy relationship to my body, I find this piece particularly relevant. In my late teenage years, I measured my self worth by how sharp were the protrusions of my shoulder and hip bones; and yet, every time I looked in the mirror, I saw a “too big” body I detested. I was totally dissociated from my true physical form, a fact reflected in, and reinforced by, my pained mental state. As a future posting of my writing will discuss, it was the practice of yoga asana—even long before I had any real consciousness of its philosophy or process—that helped me begin to dis-dissociate, to become re-embodied, to begin to see myself more clearly, and thereby begin to accept myself as I am. There is a precept in my meditation tradition: that you teach only what you embody, and you embody what you teach. I teach this practice because I practice embodying it. And in embodying it, it has worked for me. And though I can tell you it works, and though you may even believe me, you must practice it too. It is not enough to give a cognitive nod to its process. If it is to work for you, too, you must do the work. Practice it when it challenges you, as well as when it easily flows. You will strengthen the mental muscles that will assist you during life’s heaviest lifting. Julia, is mesmerizing how profound and deep your soul is. You are an inspiration to the new generation. Congratulation Julia, daughter of my life. 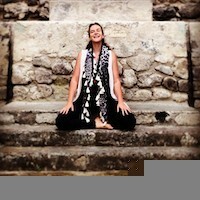 Julia believes in yoga as therapy for mind, body and spirit. Yoga is a process of continual refinement: poses are not achieved, but rather joyfully explored. Julia offers variations for every practitioner, from injured, to beginner, to “advanced,” although Julia believes that there is no such thing as a “better” yogi, only a more conscious practitioner–and anyone, regardless of physical prowess, can practice with awareness. Such regular practice helps cultivate strength, flexibility, peace of mind through acceptance, and comfort in, difficult positions–qualities that the practitioner can take off the mat and into daily life.